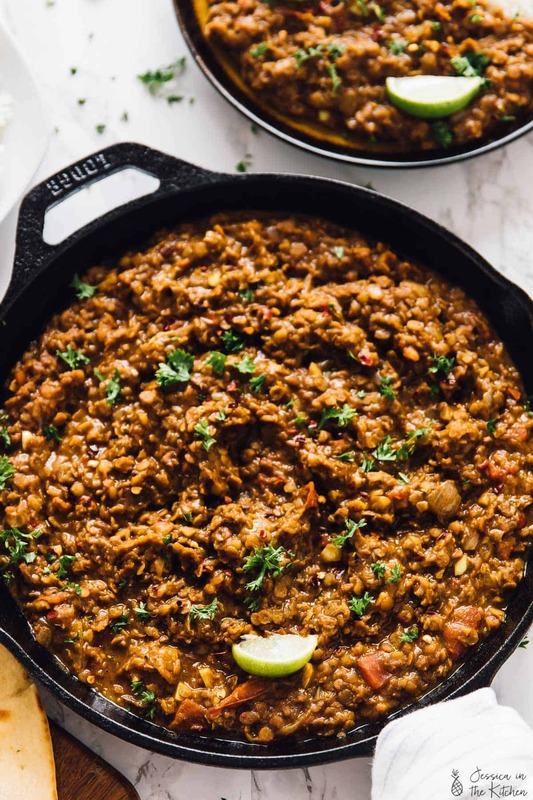 This Red Lentil Curry is SUCH a delicious curry recipe ready in an hour! It’s made easily in one pot, is vegan and freezes so well! Can I share a secret with you? It’s been a while since I last cooked. I mean, I’ve cooked to eat dinner, and oatmeal for breakfast, but after I created all those recipes for the ebook I went into a real and serious burnout mode. Writing a book is such a fun and challenging process, and at the same time, is a pretty exhausting process. I’ll say this – I don’t regret anything. I’m so glad to have finally created my first Jessica in the Kitchen product AND so grateful that the Mr. really took over with ALL the meals. 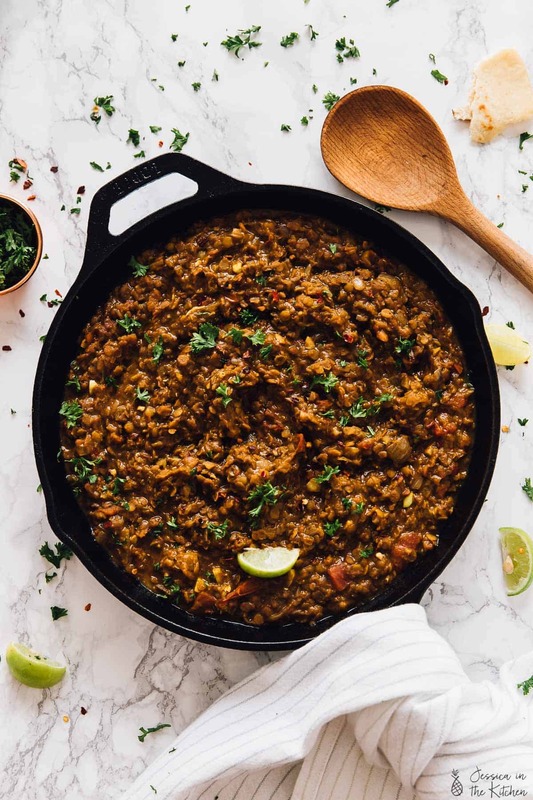 It feels amazing to be back and I’m really glad to be sharing this insane Red Lentil Curry. Oh my gosh. 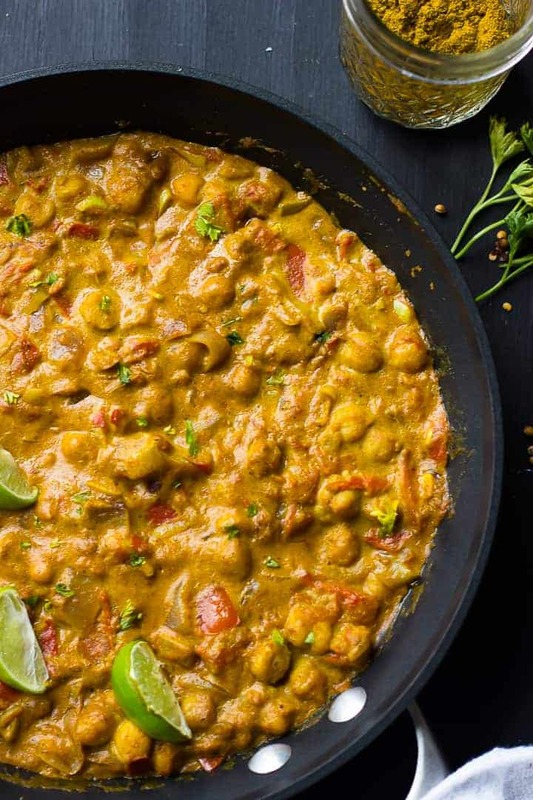 If you love my Coconut Chickpea Curry you’re going to FLIP for this. First things first – thank you to everyone for the OVERWHELMING support I got for my ebook!! Honestly, you’re the best. It was the kind of motivation that I needed to jump right back into creating even more delicious recipes to share with you. This Red Lentil Curry is exactly that. Friends, this curry is SO flavourful! I know, I know, I say that all the time, but I HAD THIS FOR BREAKFAST. Let’s pause right there. I *never* have anything but breakfast foods for breakfast. It’s sort of part of my life code – I love breakfast foods so much that I shan’t ever miss a chance to eat them. I broke that for this curry dish. 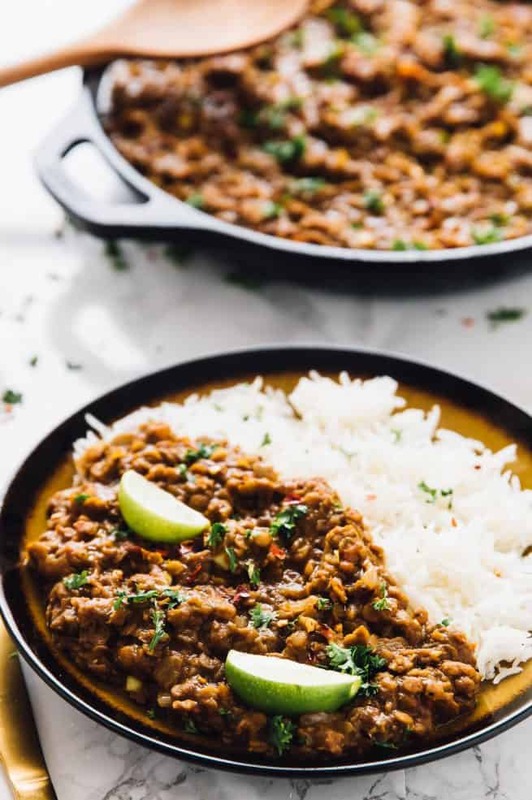 I found a way to really infuse flavour into those lentils and to create a curry dish your entire family will (guaranteed) enjoy. 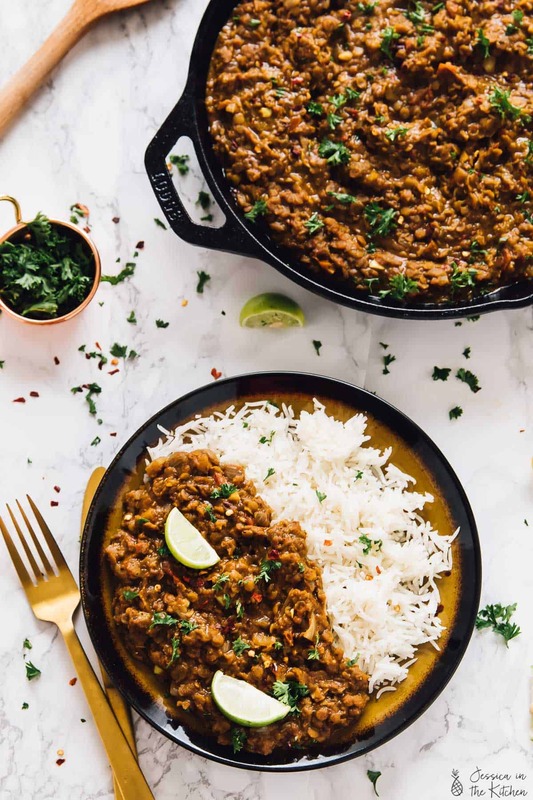 This dish reminds me of a dal that I enjoyed while in London that honestly changed my perspective. I’ve always loved Indian food, but I honestly haven’t been the biggest lentil fan. Of course I’ve made it in many recipes but after having Black Dal from Dishoom, I almost cried. Okay, so food gets me really emotional, obviously, but to this day I can vividly remember exactly how I felt after that meal. The flavour profile of that Black Dal was unlike any other. I hope to recreate it one day, but for now, this red lentil curry thoroughly reminds of that dal. I’m not 100% sure whether this curry contains what constitutes a dal dish, but I know for sure that it’s a true winner. All the ingredients here lend a helping hand – the spices, the tomatoes and onions, the coconut milk, the lime – they all come together to create a dish you’ll want to be making and eating over and over. The Mr. is literally eating it again right now as I type this. I wanted the flavours to come together easily for you, so I went ahead and also added red curry paste to the dish. It really packs that punch I was looking for, and goes beautifully with the fresh spices included. P.S. I use this red curry paste which is vegan and gluten free. I’m now convinced I’ll be using lentils way more than I have been before. They’ve proven to be very versatile and really helped to stretch this dish to serve a LOT of people. It doubles so easily, and I love that it freezes really well. Perfect for the upcoming cold months. P.S. the world is your oyster with this dish. Feel free to try this red lentil curry with spinach, tofu, cauliflower, and even potatoes! It’s easily customisable. Enjoy, friend! P.S. This is what I used for this recipe! Add in the onions and tomatoes. Grind some sea salt and ground black pepper over the mixture and stir together. Lower heat to medium and allow to cook down until juices of the tomatoes are naturally released and onions are soft and translucent, about 8 minutes. Add in all the other dry ingredients in order. Stir vigorously to combine to ensure the lentils aren't stuck to the bottom. Now add the water and coconut milk and stir again to combine thoroughly. Bring the curry to a boil, and then reduce to medium-low so that the mixture continues to simmer for 35 minutes, cover slightly but allowing steam to escape. Stir occasionally to ensure the lentils don't stick to the bottom. Depending on the kind of lentils you're using, you can check around the 20 minute mark to see if your lentils have finished cooking. Taste the curry and season with salt and pepper if you desire. Remove the curry from the heat and squeeze a lime lightly over the top of the curry, stirring to combine. Don't skip this step!! Allow to cool slightly and then serve. Enjoy! If you try this Vegan Red Lentil Curry please let me know in the comment section below, or tag me on instagram with the hashtag #jessicainthekitchen! For more exclusive recipes follow me on Instagram AND on Snapchat: jessinkitchen. HOW TO STORE: You can store this curry in an air-tight container in the fridge for up a week. It’s an excellent candidate for freezing and can be stored in the freezer for up to a month. 1. This curry lasts for at least 5 days in the fridge as leftovers. 2. You can serve with whole wheat naan bread, basmati rice, or even crispy tortilla chips. 3. You can add so many extra ingredients to this curry. I love adding spinach and other veggies to add even more flavour and body to it. 1. Crushed red pepper flakes: I would start with 1/4 teaspoon in the beginning so that that gets heated up with everything else. Taste and you can always add another 1/4 teaspoon. 2. Harissa paste: if you have a harissa or chili paste, you can stir a little in before the simmer part so that it can heat up with everything. Even sriracha can work. 3. Lastly, and my favourite, scotch bonnet pepper sauce which adds flavours and lots of heat. A few drops right before simmer again, and you can taste and decide whether you want to add more. I can have this for the breakfast too. Looks super delicious and comforting, Jessica. Thanks so much Angie!! It was so good! Yay I am SO happy to hear this!! Also, YAY for breakfast lentil curry!! Thanks so much for your feedback!! SO happy to hear that you enjoyed!! You’re so welcome!! You add the dry lentils to the mix. I hope that helps and that you enjoy!! Hi Jessica, I made this recipe for dinner last Thursday and it was delicious. I sent some home with my daughter, also, as her hubby is Vegan and they both loved it. I added chopped sweet potato, just to put a bit more ooompf into it and it was really lovely. I will do it again soon. Another great recipe. I haven’t been able to get coconut oil her in Australia, so I use Canola or Peanut oil, but it doesn’t seem to make it taste anything other than delicious! Oh I’m SO happy to hear this! Also love your additions and so glad your daughter and her husband loved it too!! Thanks so much for sharing with me!! Hi Llona, I live in a country town in Victoria, Australia, and have been using coconut oil for at least 5 years. You can get organic virgin coconut oil from supermarkets in the natural food aisles, as well as in health food shops, and online. It’s readily available and worth getting hold of. I love it. I’m looking forward to trying this recipe, too. This was SO good. It’s even better the next day actually! Next time I”m going to make it then serve the following day. Thanks for another amazing recipe! Aww I’m so happy to hear this!! Thanks so much for letting me know and you’re so welcome!! I totally agree – it is SO good the next day!! This looks awesome! I’m new to meal prepping and making vegetarian/vegan meals. I think this will be my lunch for next week wth some brown basmati rice! I’m so happy to hear and I hope you enjoy!! Let me know!! Love, live, love this recipe. It’s the first of the website I’ve tried and it was delicious! I added some chilli paste (just before the summer stage) and it really impressed my guests. It makes a great amount too so I don’t have to cook again today! Yay I’m so so happy to hear this!! Love your addition and I agree – it makes a great amount! Thanks so much for sharing with me!! This was ridiculously delicious, and such a major yum for my guy who seriously would have eaten three (pasta sized) bowls of it if there was any more left. Thank you, Jessica! Oh yay haha SO happy to hear you both enjoyed!! Wanting three pasta sized bowls is a HUGE compliment haha! You’re SO welcome and thanks so much for sharing your feedback with me!! 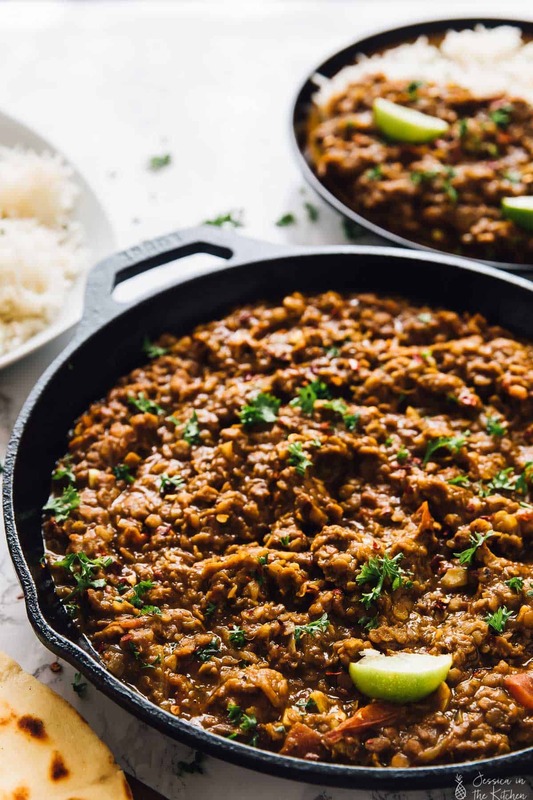 This lentil recipe is soooo delicious! I didn’t have fresh tomatoes on hand so I used canned fire-roasted tomatoes instead and it was amazing. Served with brown rice and my hubby said he could eat it everyday. Well guess what…he has ate the leftovers for the past 3 days straight and has loved it! I doubled the recipe btw 😉 thanks so much for your delicious recipes that you create and share. I have made 3 of your recipes in the last week and all were wonderful. Much love! Have you tried this in a crock pot? If so, what is the cooking time? No I haven’t, sorry Z! It might help to use a recipe already suited for a slow cooker, I hope that helps! So delicious!!! Best curry I’ve ever made. I did add some chicken thighs and grated cauliflower and zucchini. I garnished with cilantro and fresh cherry tomatoes. I serves with short grain turmeric rice!!! The dish is totally yellow, looks nice w the garnish!! I’m so happy to hear and thanks so much for letting me know!! Love your additions!! I made this red coconut curry tonight and it was absolutely divine. I had a few bites after our meal ended for a delicious dessert, too! My whole family LOVED it. Yum!!! YUMMMMMMMMMMMMMMMMMMMMM. Will be cooking again it was delish!! Thank you for your hard work getting this recipe together! You’re so welcome Brodie!! So glad you enjoyed it so much!! This was absolutely delicious! My two meat eaters gobbled it up with nothing but praise. And it fed 3 of us (including two grown men) with plenty of leftovers. I plan to add it into my monthly menu. Thank you! Yay I’m so happy to hear that!! You’re so welcome and thanks for sharing your feedback with me!! Awesome recipe!! Everyone loved It! So happy to hear – thanks for your feedback!! Hi Nicole, they should NOT be cooked! Love your website. I tried this recipe tonight and cooked it for almost an hour and the lentils were hard. I’m used to eating very soft lentils, but I’m also used to green lentils, not red ones. Did I do something wrong? Or is that the consistency of red lentils? Hi Evelin! I know I replied in email to you, but replying here too in case anyone else has this problem! 🙂 Thanks so much for your comments re my website!! Oh no! Something definitely went wrong. Red lentils are very soft in texture and this curry is very much like a daal. It sounds like your red lentils were maybe very old. Sometimes when lentils are old they don’t cook well or at all. I really hope that helps! Jessica I make so many of your recipes & this one like all the others is delicious! I (and the family) love what you do. Looks delicious. Mouth watering recipes. Really love the recipes. Hi! I can’t wait to prepare this, and I thought I had all the ingredients but it turns out I only have black lentils. I’m assuming they’re fine to use in place of red lentils…? Oh, black lentils are so divine! Yes, you can use them in place, but they might cook a little bit faster than red lentils, so ensure to check them around the 20 minute mark like the recipe says. I hope you enjoy!! Thank you so much for the response! 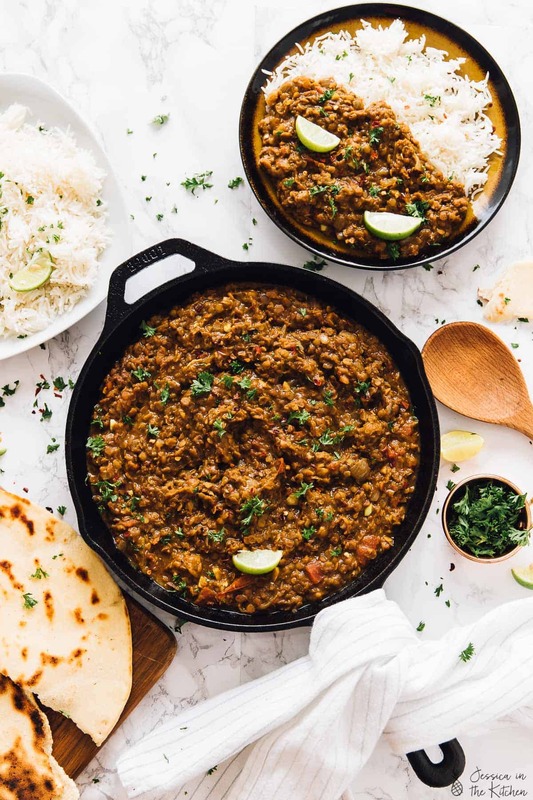 I made this lentil curry for a NYE potluck & it was a big hit! The recipe doubles beautifully, and I’m eating a bowl of leftovers right now. I dare say, it tastes even better days later! Yay!! I’m so happy to hear that!!! Thanks for sharing your feedback with me! Just made this last night as we wanted something vegetarian for the start of Lent! I didn’t have all the correct ingredients and couldn’t get out to the shops so subbed in some ground pepper,cardamom and extra curry powder for the garam masala. I had no red curry paste so just added in some fresh red chili. I added in extra aubergine and spinach to bulk it up and served it over roasted sweet potato. It was so flavourful and my husband raved about it. I will definitely make this again and imagine it would be even more tasty with the correct ingredients. So delighted to find a really yummy vegetarian dish as we want to cut down our meat consumption. Thank you Jessica! This was so good! Perfectly seasoned and so satisfying. Thanks! Wow Thanks so much Brandi!! We’re glad you enjoyed it! I just made the Red Lentil Curry – Vegan, it was very good. My husband and I are trying to eat more healthy dishes. Thank you for posting this recipe. You’re welcome Jill! We’re so happy that you enjoyed it! Thank you for trying and reading!! Hi Diane! Thank you for this kind comment! We’re glad that you enjoyed this recipe! Love your additions so much Nancy!! Extra curry paste is fine – it might be missing that curry flavour but will still taste amazing! Thanks for being here! This was literally one of the best curries I have ever had, home-made or at a restaurant! So yummy and moreish — I could have eaten the entire pan quite happily! So glad I have leftovers for lunch tomorrow <3 My omni boyfriend loved it too! Hi Jessica, I am thinking of making this for my vegan relatives at thanksgiving. Do I use sweetened or unsweetened coconut milk? Also any other suggestions for a main dish? Thanks so much! Unsweetened coconut milk for sure! This vegan meatloaf is made with chickpeas and green/brown lentils and is really impressive! https://jessicainthekitchen.com/vegan-meatloaf-gluten-free/ I hope that helps and happy Thanksgiving when it comes! I tried this recipe last night and it was delicious! I added 125g spinach which I enjoy in a curry and served on basmati rice. Yummy! Thank you! Thanks so much for sharing and so glad you enjoyed!! You’re so welcome! Thanks for sharing your recipe. My wife and I love curry and Indian food in general. I made this last night; the only substitution was leaving out the coconut milk and substituting almond milk (added it at the end, after the lentils finished cooking). It was pretty good and definitely something we’ll make again, but to be honest we both felt the garam masala was way too heavy in this one. I might suggest cutting it in half and doubling the curry powder. Hi Dr. J we’re glad that you and your wife liked the recipe. Thanks for your suggestions we’ll definitely make the recipe again soon. when we do we’ll keep your suggestion in mind. Thanks for reading! Hi Jessica! I made this for my roommates last night and it was amazing. I love how the coconut milk sweetens up the dish! I was afraid it would be too spicy, but it was just right. Thanks for sharing! Awesome Haley we’re so glad that you enjoyed this recipe! Wow what a nice comment thank you so much Keirnan. Thank you for reading and thank you for such a wonderful review. Hi Kristy thank you so much for reading! 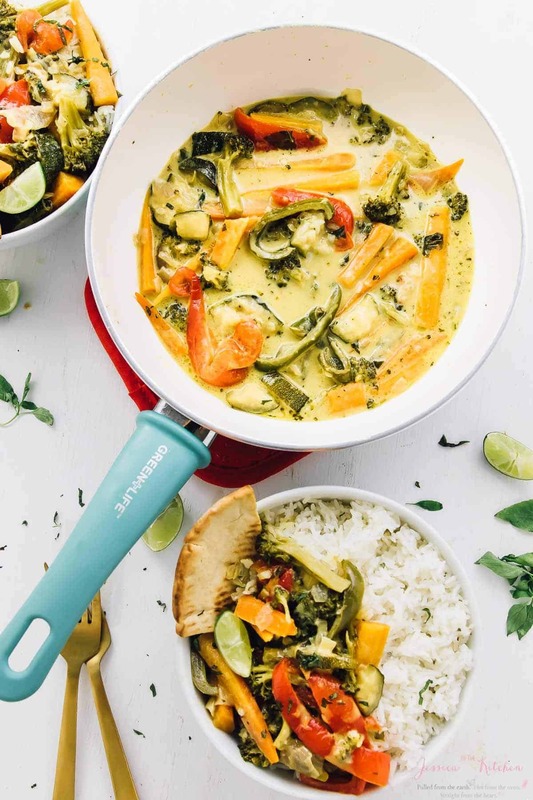 The coconut milk really reduces the spicy nature of the red curry paste, but if it is an issue you can definitely reduce it to a teaspoon or remove it all together, it may also be a good idea to remove the black pepper and red pepper flakes in the recipe as well. I hope this helps!